The Milwaukee Brewers optioned Brandon Kintzler to Triple-A on Sunday, effectively clearing a spot in the bullpen. This was a somewhat surprising move, but a move that makes sense when broken down. The Brewers tendered a Kintzler a contract of $1.075 million this offseason, which makes him an expensive minor-league player. For that reason, I find it hard to believe Kintzler will spend the season riding buses. He’ll either find his groove and be called up by Milwaukee or the Brewers will find a trade partner in order to unload him. But let’s look at why the Brewers removed him from the bullpen picture. His spring training stats weren’t favorable, but as we all know, how a player performs in spring training is completely meaningless. However, his 6.48 ERA in eight outings this spring, coupled with his underachieving 2014 season, made it apparent that Kintzler had a lost a step. 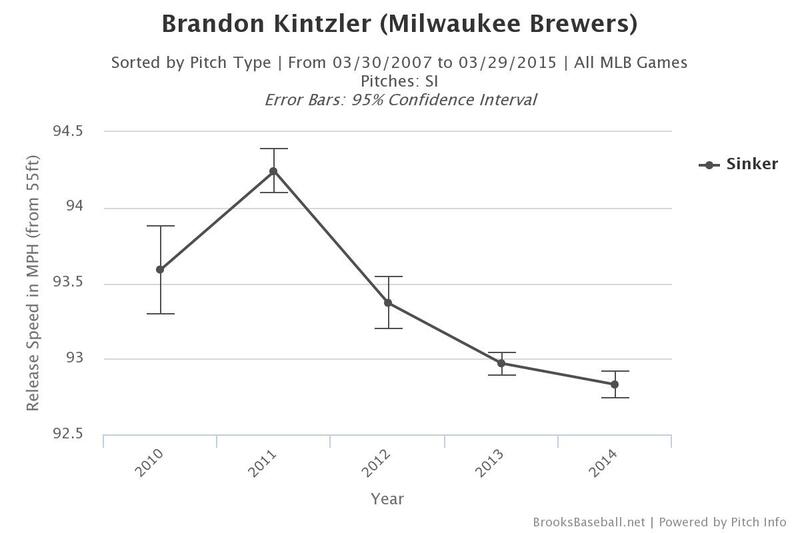 In 2013, Kintzler was the best reliever in Milwaukee’s bullpen. He posted the highest WAR (1.4), FIP (2.54) and xFIP (2.93). His sinker worked wonders as he forced hitters to put the ball on the ground 57.4% of the time and posted a 13.24 RE24. Most importantly, he kept the ball in the yard. It looked like Kintzler was destined for a brilliant 2014 season. Things didn’t go as planned, though, as Kintzler began giving up home runs, started walking hitters and saw his strikeout rate plummet (see table). Melvin acknowledged that Kintzler’s sinker has stopped being effective, and one of the possible culprits could be from a decrease in velocity. To sum up, Kintzler has been losing zip on his sinker and has been racking up fewer strikeouts for a while now. Like Melvin said, there hasn’t been much improvement for the 30 year old, and moving him to the minors was a necessary move for the club. As of now, Kintzler’s 2013 season seems like a fluke. There’s a chance he could rediscover his sinker, but he’ll need to find velocity as well, and that’s no easy to task. This may be the last we hear from him. This entry was posted in Bullpen Banter and tagged Brandon Kintzler, Milwaukee Brewers on March 30, 2015 by Justin Schultz.